Ellison's Carlos Felix, left, tags out Belton's Christian Castillo attempting to slide into second base on Tuesday at Ellison High School. Belton’s Preston Rozner rounds third base and heads home in the first inning against Ellison on Tuesday at Ellison High School. Ellison's Preston Mills pitches against Belton on Tuesday at Ellison High School. Ellison's Julien Jimenez (2) makes a backhand stop and throws to first base for an out against Belton on Tuesday at Ellison High School. Belton's Chase Fentress throws to first base against Ellison on Tuesday at Ellison High School. Belton's Dylan Blomquist (14) pitches against Ellison on Tuesday at Ellison High School. Ellison's Brian Gardner lays down a sacrifice bunt against Belton on Tuesday at Ellison High School. Ellison players celebrate against Belton on Tuesday at Ellison High School. Ellison's Julien Jimenez (2) celebrates on second base after hitting a double against Belton on Tuesday at Ellison High School. Ellison's Carlos Felix (6) dives safely back to first base as Belton's Zach Alexander attempts a tag on Tuesday at Ellison High School. The Tigers remain perfect in District 12-6A play. 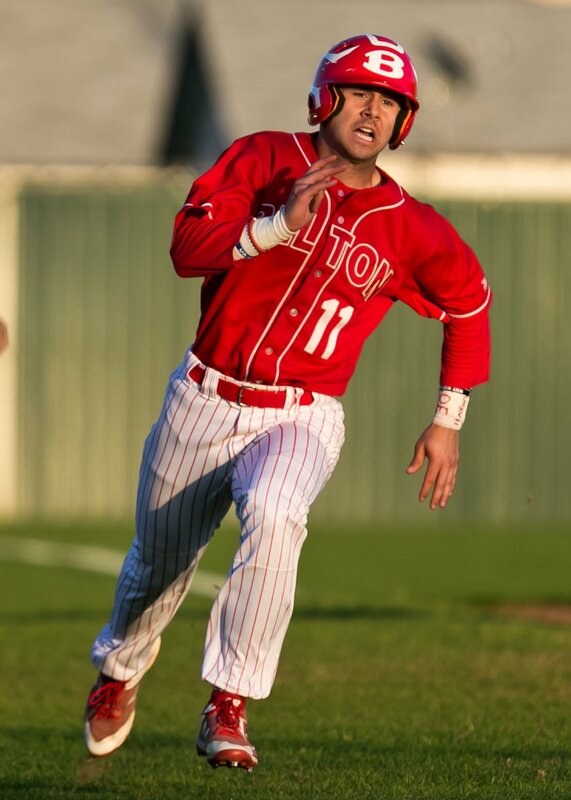 Now halfway through the district season, and after leading by just a single run throughout most of the game, a two-run homer from Jonathan Montgomery helped Belton take a 4-1 win at Ellison on Tuesday night. Eagles’ starting pitcher Preston Mills quickly got to work with back-to-back outs to open the game before giving up consecutive walks to Preston Rozner and Connor Carothers. With runners on base, Ben Jones tapped the ball into right field for a base hit that brought Rozner home and put runners on the corners, but Belton (8-0 12-6A) couldn’t get any more runs. The score remained the same through three more innings before Tigers’ starting pitcher Dylan Blomquist knocked the ball into left field for an RBI single to give Belton a 2-0 lead in the top of the fifth inning. Ellison (5-3 12-6A) answered in the bottom half with a leadoff single from Julien Vascot. A sacrifice bunt from Elias Rodriguez put Vascot in scoring position when Mills stepped up to the plate. Mills tapped a grounder into left field to allow Vascot to score and pull the Eagles’ within one, 2-1. After Mills walked Carothers to start the sixth inning, Jones popped a ball straight into the glove of the Eagles’ pitcher, who threw to first to double up the runner there. With two out in the inning, Cooper Babcock reached on an error and scored when Montgomery knocked his home run out of the park. Mills went 6 2/3 innings, striking out 10 and walking three. Blomquist pitched a complete game for the Tigers with 14 strikeouts, three walks and two hits allowed. The Tigers head to Harker Heights (4-4) next Tuesday to begin the second half of district play. The Eagles start the second half Friday against Waco (1-7). Copperas Cove 11, Shoemaker 1, 5 inn.